The College Board names Montrose as one of the nation's top schools in AP computer science offerings for girls. Montrose earned the first College Board AP Computer Science Female Diversity Award for its high number of female students enrolled in AP Computer Science courses. 25 Montrose students are enrolled in either AP Computer Science A or AP Principles of Computer Science, which are open to girls beginning in 9th grade. Out of more than 18,000 secondary schools worldwide that offer AP courses, Montrose is one of only 685 to accomplish this. "Colleges are recruiting female STEM majors," said AP Computer Science teacher Laura Rinaldi. 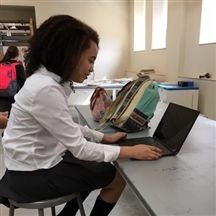 "It is in high demand, and Montrose has the vision and the execution to expose our girls to this ever-emerging field of CS and empower our students to fill this need, should they find they enjoy it." In 2018, Montrose's first year of offering AP Principles of Computer Science, every student passed the AP exam, with the majority earning a top score of 4 or 5.